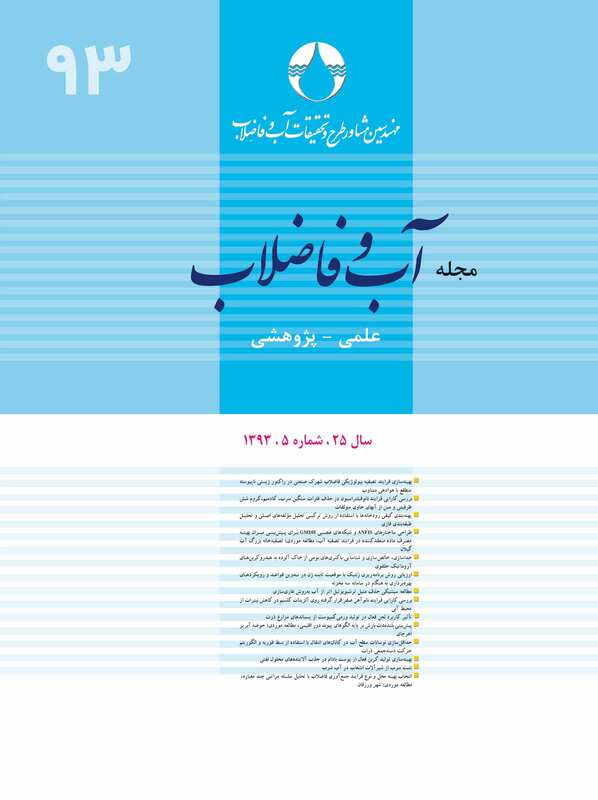 داغبندان, الهیار, اکبری زاده, محمد. (1394). طراحی ساختارهای ANFIS و شبکه‌های عصبی GMDH برای پیش‌بینی میزان بهینه مصرف ماده منعقدکننده در فرایند تصفیه آب، مطالعه موردی: تصفیه‌خانه بزرگ آب گیلان. مجله آب و فاضلاب, 25(5), 32-41. الهیار داغبندان; محمد اکبری زاده. "طراحی ساختارهای ANFIS و شبکه‌های عصبی GMDH برای پیش‌بینی میزان بهینه مصرف ماده منعقدکننده در فرایند تصفیه آب، مطالعه موردی: تصفیه‌خانه بزرگ آب گیلان". مجله آب و فاضلاب, 25, 5, 1394, 32-41. داغبندان, الهیار, اکبری زاده, محمد. (1394). 'طراحی ساختارهای ANFIS و شبکه‌های عصبی GMDH برای پیش‌بینی میزان بهینه مصرف ماده منعقدکننده در فرایند تصفیه آب، مطالعه موردی: تصفیه‌خانه بزرگ آب گیلان', مجله آب و فاضلاب, 25(5), pp. 32-41. داغبندان, الهیار, اکبری زاده, محمد. طراحی ساختارهای ANFIS و شبکه‌های عصبی GMDH برای پیش‌بینی میزان بهینه مصرف ماده منعقدکننده در فرایند تصفیه آب، مطالعه موردی: تصفیه‌خانه بزرگ آب گیلان. مجله آب و فاضلاب, 1394; 25(5): 32-41. در این مطالعه با توجه به اهمیت منابع سطحی در تأمین آب شرب و لزوم استفاده از مواد شیمیایی گوناگون در مراحل مختلف تصفیه این گونه آب‌ها، میزان مصرف مواد منعقد کننده در فرایند تصفیه آب مورد بررسی قرار گرفت. یکی از مهم‌ترین قسمت‌های فرایند تصفیه آب، مربوط به میزان مصرف مواد منعقدکننده در واحد انعقاد و لخته‌سازی است. در تصفیه‌خانه، برای تعیین نوع و غلظت منعقدکننده مناسب، از آزمایش جار استفاده می‌شود. این آزمایش وقت‌گیر و همراه با خطا است و نمی‌توان زیاد به نتایج آن استناد کرد. برای رفع این مشکل می‌توان از روش‌های هوشمند استفاده کرد. در این تحقیق داده‌های آزمایشگاهی سال 91-1390 پس از جمع‌آوری و پالایش، مورد مطالعه قرار گرفتند. با بهره‌گیری از سیستم استنتاج فازی-عصبی تطبیقی (ANFIS) و شبکه‌های عصبی نوع GMDH و با استفاده از نتایج تجربی به‌منظور دستیابی به مقدار بهینه مصرفی منعقدکننده پلی‌آلومینیوم کلراید در تصفیه‌خانه رشت، دو مدل غیرخطی ارائه شد.اثر پارامترهای ورودی شامل دما، pH، کدورت، جامدات معلق، هدایت الکتریکی و رنگ بر میزان مصرف منعقدکننده بررسی شد. نتایج نشان داد مدل ANFIS نسبت به مدل GMDH کارایی بهتری برای پیش‌بینی میزان مصرف منعقدکننده پلی آلومینیوم کلراید دارد. Given the increasing importance of surface water bodies as supply sources of drinking water and regarding the requirement for using different chemicals at various stages of water treatment processes, it is essential to investigate coagulant consumption in water treatment plants. Determination of the required dosage of coagulants used in the coagulation and flocculation unit is one of the most important decisions in water treatment operations. For this purpose, the jar test is generally used to determine the type and concentration of suitable coagulants in a water treatment plant. However, the test is rather time-consuming and unreliable due to the inaccurate results it yields. Instead, intelligent methods can be employed to overcome this shortcoming of the jar test. In this study, experimental data were collected over the period from 2011 to 2012 and further refined for study. Two non-linear models based on adaptive neuro-fuzzy inference system (ANFIS) and GMDH-type neural networks were then developed and experimental results were used to determine the optimum poly-aluminium chloride dosage for use at Guilan water treatment plant. The effects of input parameters including temperature, pH, turbidity, suspended solids, electrical conductivity, and color were investigated on coagulant dosage. The ANFIS model was found to outperform the GMDH model in predicting the required poly-aluminium chloride dosage. 1. Maniezzo, V. (1994). “Genetic evolution of topology and weight distribution of neural networks.” IEEE. Trans. On Neural Networks, 5(1), 39-53. 2. Bratby, J. (2006). Coagulation and flocculation in water and wastewater treatment, IWA Pub., USA. 3. Hu, C., Lu, H., Qu, J., Wang, D., and Rut, J. (2006). “Coagulation behavior of aluminum salts in eutrophic water: Significance of Al13 species and pH control.” Environmental Science and Technology, 40(1), 325-331. 4. Dentel, S.K. (1991). “Coagulant control in water treatment.” Critical Reviews in Environmental Science and Technology, 21(1), 41-135. 5. Edzwald, J. (1993). “Coagulation in drinking water treatment: Particles, organics and coagulants.” Water Science and Technology, 27(11), 21-35. 6. Hanson, A.T., and Cleasby, J.L. (1990). “The effects of temperature on turbulent flocculation: Fluid dynamics and chemistry.” J. American Water Works Association, 82(11), 56-73. 7. Gregor, J., Nokes, C., and Fenton, E. (1997). “Optimising natural organic matter removal from low turbidity waters by controlled pH adjustment of aluminium coagulation.” Water Research, 31(12), 2949-2958. 8. Juntunen, P., Lu, K., Konen, M., Pelo, M., Lehtola, M.J., and Hilton, Y. (2012). “Modeling of water quality: An application to a water treatment process.” Applied Computational Intelligence and Soft Computing, Article ID: 846321. 9. Heddam, S., Bermad, A., and Dechemi, N. (2012). “ANFIS-based modelling for coagulant dosage in drinking water treatment plant: A case study.” Environmental Monitoring and Assessment, 184 (4), 1953-1971. 10. Yu, R.F., Kang, S.F., Liaw, S.L., and Chen, M.C. (2000). “Application of artificial neural network to control the coagulant dosing in water treatment plant.” Water Science and Technology, 42 (3-4), 403-408. 11. Shariff, R. (2007). Real-time artificial intelligence control and optimization of a full scale WTP, American Water Works Research Foundation. 13. Gagnon, C., Grandjean, B., and Thibault, J. (1997). “Modelling of coagulant dosage in a water treatment plant.” Artificial Intelligence in Engineering, 11(4), 401-404. 14. Leeuwen, V. (1999). “Empirical mathematical models and artificial neural networks for the determination of alum doses for treatment of southern Australian surface waters.” Aqua, 48(3), 115-127. 15. Maier, H.R., Morgan, N., and Chow, C.W.K. (2004). “Use of artificial neural networks for predicting optimal alum doses and treated water quality parameters.” Environmental Modelling and Software, 19(5), 485-494. 16. Wu, G.-D., and Lo, S.-L. (2008). “Predicting real-time coagulant dosage in water treatment by artificial neural networks and adaptive network-based fuzzy inference system.” Engineering Applications of Artificial Intelligence, 21(8), 1189-1195. 17. Jamali, A., Narmian-zadeh, N., Ashraf, H., and Jamali, Z. (2008). “Robust Pareto design of ANFIS networks for nonlinear systems with probabilistic uncertainties.” IEEE, International Sysmposium, Istanbul, 300-304. 19. Zadeh, L.A. (1965). “Fuzzy sets.” Information and Control, 8(3), 338-353. 20. Jang, J.S.R. (1993). “ANFIS: Adaptive-network-based fuzzy inference system.” Systems, Man and Cybernetics, IEEE Transactions, 23(3), 665-685. 21. Ivakhnenko, A., and Ivakhnenko, G. (1995). “The review of problems solvable by algorithms of the group method of data handling (GMDH).” Pattern Recognition and Image Analysis, 5, 527-535.